Factor investing tends to work the best among the smallest stocks. Tilting toward small-cap stocks alone isn't a great way to improve long-term performance. Small-cap stocks have historically offered a small edge over their larger counterparts, but that slight return advantage hasn't been much compensation for their higher risk and decade-long stretches of underperformance. However, other factors, like value, momentum and low volatility, have tended to work better among smaller stocks. Deliberately targeting small-cap stocks with these characteristics will likely be more fruitful than a broad-based approach to investing in a broader cross section of smaller firms. The payoff to the value factor offers a stark illustration. Exhibit 1 shows the returns on 25 portfolios of U.S. stocks formed on the basis of stocks' size and book/price ratios (a measure of value, with larger values indicating relatively cheaper stocks). I've sourced this data from the French Data Library for the period from July 1963 through May 2018. Each portfolio has roughly the same number of stocks and is market-cap-weighted, so the small-cap portfolios represent a smaller portion of the market than the large-cap portfolios. All portfolios are updated once a year at the end of June. The column labelled "5–1" in Exhibit 1 shows the return spread between the portfolios of the cheapest and most-expensive stocks across five different size strata. So, for example, the cheapest fifth of U.S. large-cap stocks outpaced the most-expensive fifth by 1.62 percentage points annually, which isn't bad. But the return gap between deep-value and high-growth stocks increases dramatically as we move down the market-cap ladder. To understand this performance pattern, it is important to understand the explanations for the value effect more broadly. Value stocks are thought to outperform either because they are riskier than their more-expensive counterparts and offer higher expected returns to compensate investors for that risk, or because they are mispriced. The risk-based explanation is plausible. Value stocks tend to have less-attractive business prospects than more richly valued stocks. That said, growth stocks--especially small-growth stocks--come with significant risks of their own, most notably the risk of failing to live up to the lofty expectations embedded in their prices. 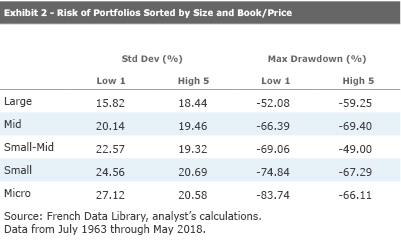 During the sample period, the large-value portfolio did in fact exhibit greater volatility and a larger maximum drawdown than its growth counterpart. But the opposite was true of the small-value portfolios, as shown in Exhibit 2. This suggests that these value portfolios were less risky than their growth counterparts and that mispricing is the more likely driver of their higher returns. It's reasonable to believe that small-cap stocks are more prone to mispricing than large-cap stocks because they don't attract as much investor attention or analyst coverage. Consequently, their prices may not reflect all publicly available information. However, we can't rule out the risk-based explanation for the value effect among small-cap stocks because risk can still be present without being realized. For example, even if a corporate borrower doesn't default on a loan, that outcome is still possible and investors must be compensated for that risk. As is the case with value, the advantage of tilting toward low-volatility stocks has historically been the biggest among the smallest stocks, as Exhibit 3 illustrates. This table shows the returns on 25 portfolios of U.S. stocks sorted on size and volatility for the previous 60 days, updated monthly. The return spread between the least- and most-volatile fifth of U.S. large-cap stocks was 1.44 percentage points annualized from July 1963 through May 2018, but the corresponding figure among micro-cap stocks was 19.37 percentage points annually. The inverse relationship between stocks' size and the efficacy of the low-volatility effect likely stems from greater mispricing among smaller stocks. For instance, there may be greater lottery-seeking behaviour among small-cap stocks, where investors overpay for volatile stocks that offer a small chance for a big payoff, because these stocks tend to offer greater upside potential than their larger counterparts. But that's not the whole story. A regression analysis revealed that the low-volatility portfolios tended to favour cheaper and more-profitable stocks than their more-volatile counterparts. So, one of the reasons the low-volatility effect works the best among the smallest stocks is because it partially captures the value effect. Additionally, the low-volatility portfolios had greater exposure to the momentum factor (which has historically been associated with higher returns), and this gap was the widest among micro-cap stocks and the narrowest among large-cap stocks. This suggests that momentum contributed to the greater efficacy of the low-volatility strategy among the smallest stocks. Momentum has also tended to offer the best returns among the smallest stocks, at least on paper, as Exhibit 4 shows. In practice, the transaction costs of this high-turnover strategy would eat a big chunk of these hypothetical returns, so a microcap momentum strategy isn't advisable. But this return pattern provides further support for the idea that there is greater mispricing among the smallest stocks in the market than there is among large caps. Momentum likely arises because investors are slow to react to new information, causing prices to adjust more slowly than they should. Because smaller stocks don't attract as much attention as larger ones, it probably takes longer for new information to be reflected in their prices, which could explain why the returns to momentum are higher among smaller names. Once a trend is established, investors may pile into the trade, pushing prices away from fair value, leading to the long-term reversals associated with the value effect. So, this bigger momentum effect among small stocks is also consistent with a bigger value effect. Unlike the other factors, profitability (investing in the most-profitable firms) worked almost as well among large-cap stocks as it did among the smallest stocks, as illustrated in Exhibit 5. It isn't obvious why this factor bucked the small-cap amplification pattern. However, it may have something to do with the fact that the largest stocks in the market tend to be the most profitable. Highly profitable stocks tend to be less volatile and hold up better during market downturns than their less-profitable counterparts. So, if anything, it would be reasonable to expect these stocks to offer lower returns for their relative safety. Of course, there is always a risk that they could underperform, as they often do during strong market rallies. It is likely that mispricing across the market-cap spectrum contributed to this effect. For example, highly profitable stocks could become undervalued if investors do not fully appreciate the long-term sustainability of their earnings power. Or they may simply prefer riskier stocks that offer greater return potential, similar to the low-volatility effect. Yet, to the extent that the profitability and low-volatility effect arise from a common bias, it is a bit of a puzzle why the former wasn't also much bigger among the smallest stocks. 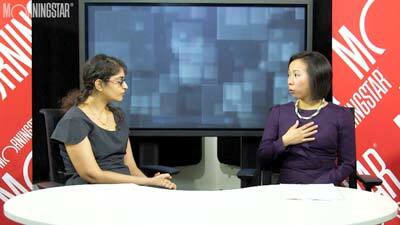 The U.S. results were consistent with the factor return patterns among international stocks. I ran a similar analysis using the global ex-U.S. portfolios formed on profitability, value and momentum (low-volatility portfolios weren't available) from November 1990 through May 2018. Value and momentum worked much better among the smallest stocks than among the largest, while profitability only worked slightly better among the smallest stocks.